Here is Las Vegas Strip hotels map in 3D that you can print in PDF and take with you! You can print a new up-to-date map of most important Vegas hotels and casinos located on the West and East sides of the Strips, as well as a separate map that show which hotels offer which permanent shows. While it's easy to navigate the Strip, these maps will tell you exactly which way to go from one hotel to the other and will give you an idea how far your hotel is located from the one you are going to for a show. For all these maps I used Google Earth imagery. They are absolutely free to use and print! Here is a printable Las Vegas Strip hotel map showing major resorts and casinos. 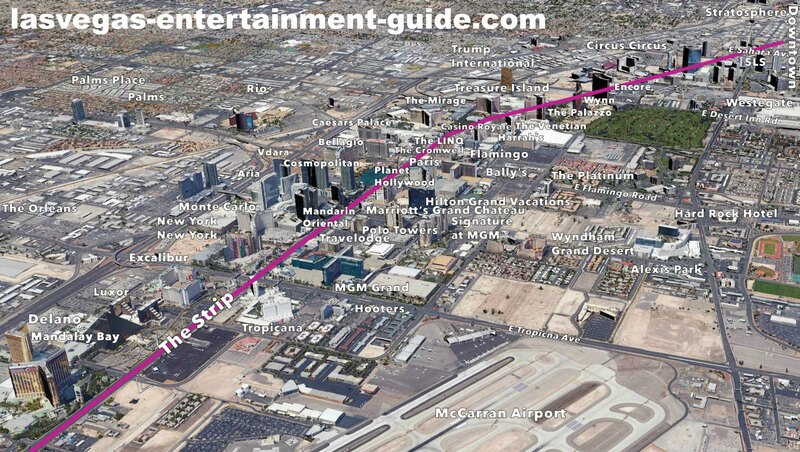 The following hotels you will find on the left side (West) and right side (East) of the Las Vegas Strip hotel map above. They are close enough, some within a walking distance from the Strip. This Las Vegas Strip hotels map shows you which hotel offers which permanent shows. The following shows are playing on the left side (West) and right side (East) of the Las Vegas Strip hotel Map above.